The Gallup Daily U.S. Employment , poll estimates unemployment at 6.3% and underemployment at 14.5%. Gallup cautions: "Because results are not seasonally adjusted, they are not directly comparable to numbers reported by the U.S. Bureau of Labor Statistics, which are based on workers 16 and older. Margin of error is ±1 percentage point." Actually the numbers can be compared. All one has to do is use the BLS non-seasonally adjusted numbers. 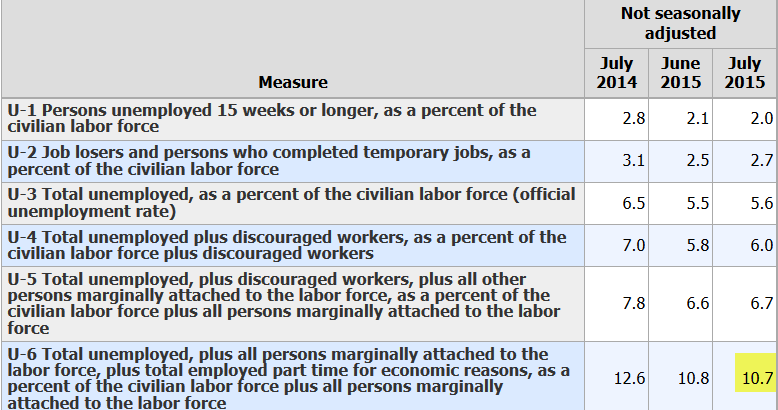 Gallup estimates the unemployment rate at 6.3% but the BLS says 5.6%. If anything, the BLS number should be higher than Gallup. Because Gallup surveys those 18 and older whereas the BLS surveys 16 and older. 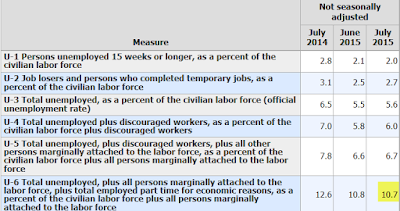 Given high youth-unemployment, any BLS bias should be higher, not lower. 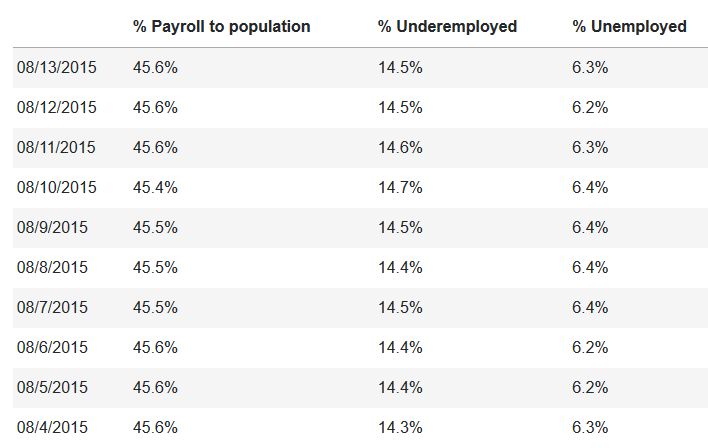 And please check out the massive difference in underemployment. The BLS says 10.7% while Gallup says 14.5%! Gallup uses a 30-day rolling average, not seasonally adjusted, and samples 30,000 people for their rolling-average numbers. The Gallup numbers are more believable than the BLS numbers. Finally, for comparison purposes, the University of Michigan sentiment survey does a one-time sample of a mere 500 people on which it allegedly measures spending habits and the economic health of the entire nation. For my take on sentiment, please see Sentiment as a Measure of Health of the Economy; Sentiment Theory vs. Practice.